A new batch of materials from Central Piedmont Community College (CPCC) is now available online. The documents, stored in vertical files at CPCC’s archives, consist of school administrative documents and yearbooks from the 1950s and 1960s. The materials document the operation and administration of the predominantly black Carver College (later renamed Mecklenburg College) and the Central Industrial Education Center before their merger to form CPCC in 1963. The batch contains the entirety of both the Carver College Collection and the Central Industrial Education Center Collection from CPCC’s archives. For detailed finding aids on either collection, please follow the links. The new materials are an addition to the CPCC memorabilia and yearbooks already hosted online at DigitalNC. Please visit their partner page or website for more information. 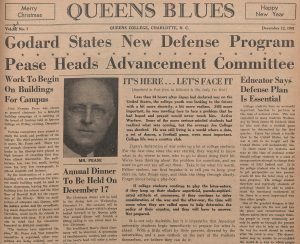 A new batch of newspapers from Queens University of Charlotte is now online. The batch covers a 20 year span (1931-1951) of Queens Blues, the student newspaper for Charlotte’s Queens College. An all female liberal arts institution, Queens College began admitting male students after the Second World War and later became Queens University of Charlotte. The issues provide interesting insights into the world of young, educated women during a crucial period in American history – The Great Depression and World War II. The contents largely concern themselves with goings-on at the school itself, but touch upon wider events as well. The front page shown above, for example, illustrates how college students reacted to the Japanese attack on Pearl Harbor and America’s entry into World War II. 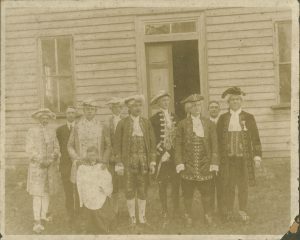 The newly digitized materials are an addition to the considerable amount of Queens University materials already online at DigitalNC. Visit their DigitalNC partner page here or head to the QUC Library website for more information. A new batch of materials from the Page-Walker Arts & History Center is now online at DigitalNC. The batch consists of research notes compiled by author Thomas M. Byrd for his 1994 book, Around and About Cary, which describes the history of Cary, NC. The notes include pages of draft edits, copies of primary and secondary sources, correspondence, census information, and various planning documents. 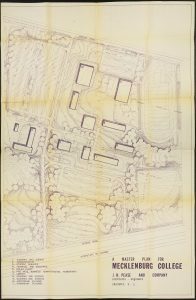 Byrd’s notes are a great resource for those interested in the history of Cary or, more generally, the planning and composition of local history works and the overall growth of the Wake County and Triangle area of North Carolina. Byrd’s notes are another addition to the existing Page-Walker Arts & History Center materials hosted online at DigitalNC. Please visit their website or DigitalNC partner page for more information. 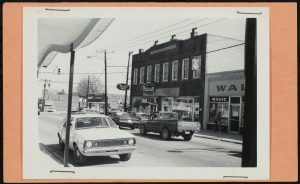 A new batch of over 150 photos from the Mount Airy Museum of Regional History is now online at DigitalNC. 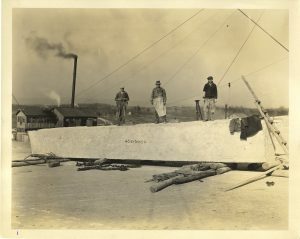 The photos document the operations of the North Carolina Granite Corporation of Mount Airy, NC roughly between 1900 and 1970. The NCGC, which operates what has been recognized as the largest open-faced granite quarry in the world, was founded over 125 years ago. Most of the photos originate in the period during which John Davis Sargent served as the superintendent and later president of the company (1910-1945). He is present in many of the depicted scenes. 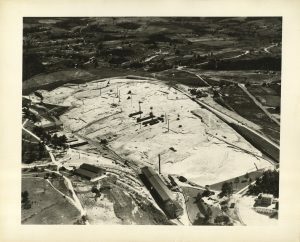 The newly digitized images fall into four major categories: quarry operations, aerial views, quarry personnel, and building projects. Perhaps the most striking of the four are the aerial photos, which give one a sense of the scale of operations at the NCGC. 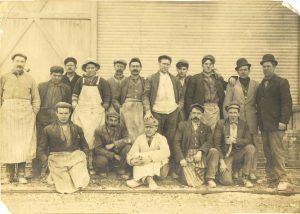 The personnel and operations photographs are fascinating as well, for they allow one a glimpse into the backbreaking and dusty world of stonework during early 20th century. The NCGC constituted an important source of white granite in the Eastern US throughout the 20th century and the stone produced at the Mount Airy quarry can be seen in countless buildings and monuments in the area. 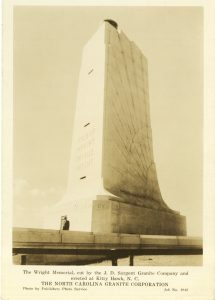 Some prominent examples include Wright Brothers National Memorial at Kill Devil Hills, NC (pictured below), the United States Bullion Depository at Fort Knox, Kentucky, and the Arlington Memorial Bridge, which bridges the Potomac River between Washington, DC and Arlington, Virginia. Many houses, churches, monuments, and municipal buildings across North Carolina also feature Mount Airy granite, photos of which constitute a major portion of those now online at DigitalNC. The Wright Brothers National Memorial at Kill Devil Hills, N.C.
For more information, please see the Mount Airy Museum of Regional History website or visit their contributor page here at DigitalNC. Interested in Cold War history? A new batch of materials from Alamance County Public Libraries (ACPL) is now online at DigitalNC. 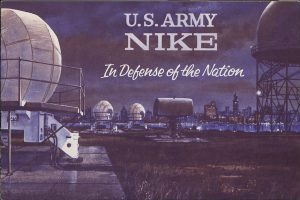 The materials, which include several publicity scrapbooks, three photo albums, and a collection of loose photographs, detail the Western Electric Company’s involvement in the US Army’s Nike Missile Program during the 1950s and 1960s. Throughout that period, the Western Electric Company manufactured guidance equipment for the Nike missiles, which were part of a large anti-ICBM defense network then under development by the US Military. The company operated a major manufacturing facility in Burlington, NC, a plant that features heavily in the ACPL materials. In 2016, the old plant was officially listed as part of the National Register of Historic Places by the National Park Service. 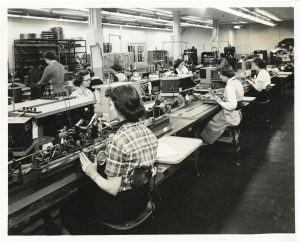 The scrapbooks were donated to ACPL by longtime Western Electric employee Raymond Donnell (1921-2002) and include a wealth of press clippings, memos, and photographs concerning the Tarheel Army Missile Plant in Burlington, NC and Western Electric’s missile-related activities in general. Many of the clippings relate to the political battles surrounding the Nike Program and the program’s effects on Burlington and the surrounding area. The photographic materials relate both to Western Electric’s production of missile guidance equipment and the US Military’s use of it. 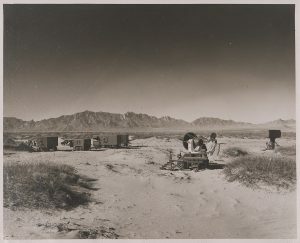 Many of the photographs provide views of the working environment at the Tarheel Army Missile Plant during 1953, while the three albums detail various tests at the White Sands Missile Range in New Mexico and facilities at the Kwajalein Pacific Missile Test Range. The newly digitized materials are an addition to the considerable amount of ACPL materials already online at DigitalNC. Visit ACPL’s DigitalNC partner page here or head to their website for more information. 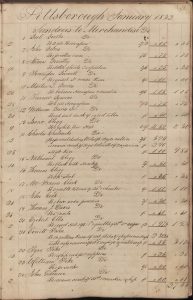 A trio of nineteenth-century business ledgers from the Cumberland County Public Library are now online at DigitalNC. The ledgers date from the 1830s, the 1850s, and the 1870s, respectively, and can help teach us more about the daily lives of North Carolinians during the nineteenth century. 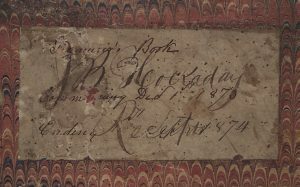 Particularly interesting is the first ledger, which dates from 1832-1834 and documents the business dealings of the merchants Womack and Goodwin in Pittsboro. Operating as general merchants, the firm served the local community with wares ranging from lace, to nails, to sugar, and everything in between. The second ledger dates from 1852 to 1854 and documents the transactions of an unidentified merchant who conducted business in Cumberland County, Randolph County, and elsewhere. It includes transactions with several prominent Randolph County personalities, including Isaac Holt Faust (1818-1864), a wealthy slaveholder and estate owner, and Pinckney Davenport II (1811-1867), a local moonshine distiller. A selection of papers from the family of Foust’s daughter can be found in the Harris and Foust Family Papers, part of the Southern Historical collection at UNC’s Wilson Library. 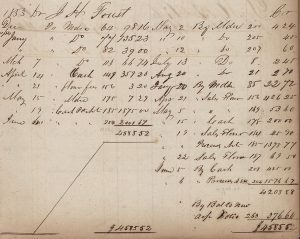 The third ledger includes more account information, attributable either to one JB Hockaday or one NA Stedman Jr. of Fayetteville, and dates from 1873-1875. The first 21 pages of this ledge are pasted over with unidentified drawings and newspaper clippings, mainly consisting of prose and poetry. For more materials from the Cumberland County Public Library, please visit their website or their contributor page here at DigitalNC. A single issue of The Casket, the student literary magazine of the Chowan Female Collegiate Institute (later Chowan University) is now online at DigitalNC. 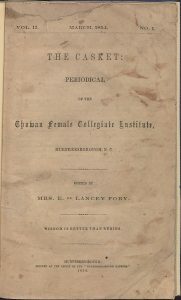 The issue, which dates from March 1854, is an interesting window into the minds of young, educated women during the mid-Nineteenth Century. The writings within explore topics like religion and the home, but are especially remarkable for supporting views that seem decidedly modern about women. For example, a piece written by one E. Lee attacks the viewpoint that women are incapable of mathematical thinking and closes with the following proclamation: “Henceforth, then, let it be acknowledged not only that Woman has a fibre more in the heart than man, but that she has also as many cells in the brain” (page 6). Another column by the same author criticizes the existing historical and literary canon for ignoring the achievements of women in both fact and fiction. “The world’s history, from the most remote period, furnishes a record of the noble deeds and attainments of man [emphasis in original]…,” she writes, then asking, “But whither shall we look for an account of woman’s deeds? As a sword in its sheath, they are concealed” (page 7-8). 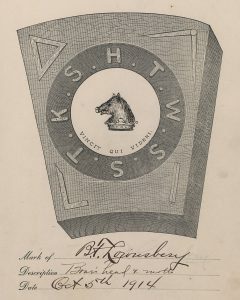 This issue of The Casket is held by UNC Libraries as part of the North Carolina Collection. 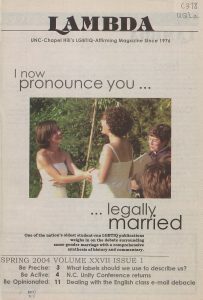 Click here to learn more about the other UNC materials hosted online at DigitalNC. 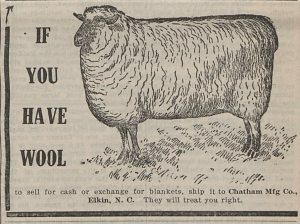 100 issues of the Carolina Union Farmer are now online at DigitalNC. The recently digitized issues form a nearly complete representation of the weekly paper’s publication between July 1911 and May 1913. 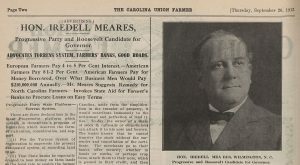 Published by the North Carolina Farmer’s Union, the paper provides unique insights into the Labor Movement as it manifested itself in the South during the early twentieth century. The issues deal heavily with economics, politics, religion, and topics of agrarian interest, all seen through a distinctly Progressive-Era lens. Many articles urge their audiences to organize against large corporate farming interests and provide instruction as to how the average farmer might go about doing so. Also included are pages of classified and commercial ads, op-eds, cultural submissions such as poetry and prose, and notifications for events and programs hosted by the Farmer’s Union. 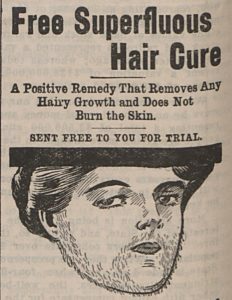 Many of the issues published in the second half of 1912 feature columns related to the 1912 national and state elections, with political advertisements and endorsements occupying several pages. 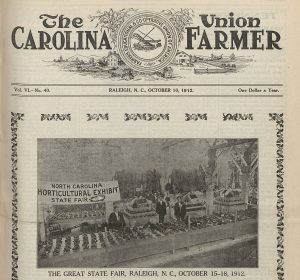 These issues of The Carolina Union Farmer are held by UNC Libraries. Click here to learn more about the other UNC materials hosted online at DigitalNC.